In Episode 50, a chat with long-time LGBTI human rights activist Rodney Croome. We explore the lessons learnt from the early campaigns to legalise homosexuality, unpack why personal stories are key, and small target strategies a mistake. Plus we zero in on the dangers of the 'religious freedom' movement. Further information and links for my chat with Rodney Croome, can be found here, https://pushingtheedge.org/50. 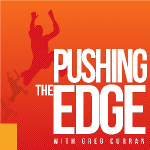 There's also many more Social Justice-inspired educators and community leaders to listen to, in our 'Pushing The Edge with Greg Curran' podcast archive, https://pushingtheedge.org/social-justice-resources. Follow me on Twitter - @GregBCurran - and let me know what you think of this episode. And if you enjoyed our chat and found it useful, please share it with others. Thanks for listening and your support.